It therefore selected a one-stop strategy, when two was expected for most, with the medium tyre taking the brunt of the distance. And it very nearly worked, giving us a classic finish with the sort of strategy variation converging in the late laps that the Pirelli formula is designed to create, but doesn't always manage. Bottas was Merc's lead this weekend and he cleared Kimi Raikkonen off the line, sat in second in Vettel's fumes and never gave him peace at any point of the race. Once the strategy game became clear the gap between the pair varied. Vettel stretched it to seven seconds with 20 laps left, but from then on Bottas cut Vettel's lead time after time. With a handful of tours left he was taking a second out every lap and Vettel was snaking conspicuously in most turns. It looked a Bottas slam dunk. As usual though the gains got more modest as he neared Vettel's turbulence. Yet still he was just about within striking distance on the final lap and Bottas had a half-lunge for the lead at the first turn; he might though have been better to line himself up for turn four. As it was he lost momentum and there was nowhere else to pass on the lap. It was Vettel's day. And he was suitably exhilarated. "Those tyres were done, they were done, for the last few laps,” he exclaimed on his team radio. "I came on the radio with 10 laps to go and said I had everything under control. That was a lie, I had nothing under control…," he continued on the podium. "When they told me the pace of Valtteri at that time, I said no way I can do that. "I did the maths in the car and thought he was going to catch me. I tried to keep it as clean as possible. 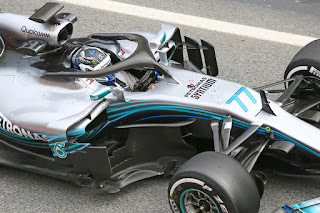 "[Bottas] going onto the medium tyre I thought that was checkmate as we had to come in again. That was the original plan but we diverted again and tried to make them last and nurse them as much as I could. And it worked but only just. There wasn't much - Valtteri had a bit of a sniff but fortunately he ran out of laps so I am really happy." Bottas meanwhile was rueful. "I knew because we were on the harder compound that there was a chance they would struggle in the end, and he was starting to struggle," he said. "I was trying to get every lap and every corner perfect to catch him, but it was not enough. Being second with such close margin in the end is extremely disappointing." Hamilton was able to salvage third and provided typical fireworks climbing the order quickly, including passing Fernando Alonso, Esteban Ocon and Nico Hulkenberg in one go on lap five. 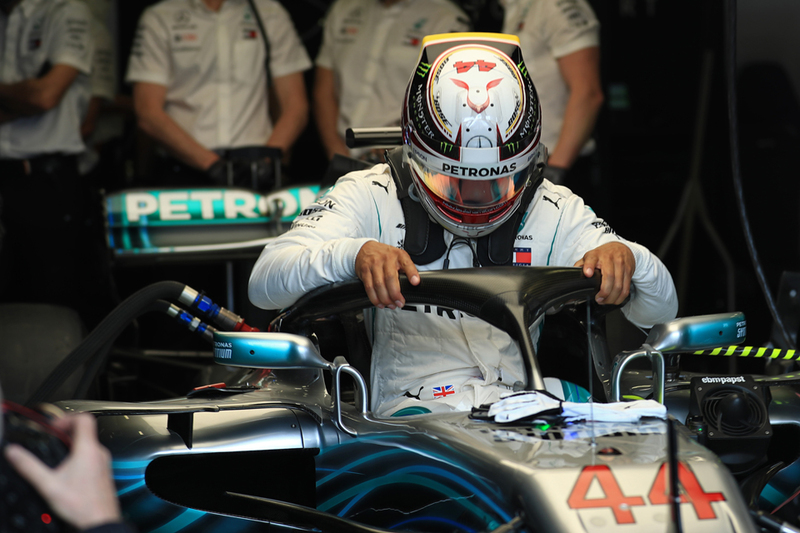 He'd cleared all non-Ferraris and Mercs by lap eight, but even so he was 14 seconds off the lead and therefore there was nothing more to be done, even with the Mercedes master strategy. 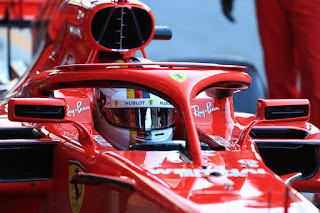 Raikkonen was in the mix too, though he was removed when Ferrari sought to split its ticket by bringing him in for a second time, and he somehow was released even though his left-rear wheel hadn't yet been removed yet let alone replaced. Kimi with a mixed set stopped immediately. A Ferrari mechanic has a broken leg. Max Verstappen - starting 15th after binning it in qualifying - looked racy as always but removed himself after just a lap, pushing things a little too far when passing Hamilton and getting a puncture from the resultant contact which put him out. 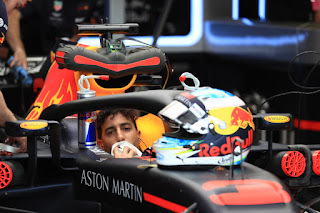 And within seconds Daniel Ricciardo also was parked with some sort of electrical shutdown. Nil points. We yet await to see where Red Bull's potential, strongly hinted at in 2018, actually lies. Practice here suggested it had the strongest race pace of all. "Frustrating for everyone because we genuinely felt like we had a good car coming into the race," said Ricciardo. "Only did a lap and a half, could see Kimi in front, looked like he was already sliding on the rears, felt like we were in with a chance." Toro Rosso meanwhile in Bahrain underlined in even thicker ink F1's capacity to surprise. After tooling around off the pace in Australia, and having a familiar Honda failure, here it showed a level of pace in Pierre Gasly's hands that even the team struggled to understand - even with its aero upgrade between times. 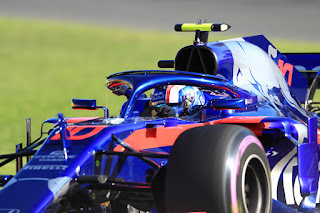 "I don't know if we will be as fast in other races," Gasly added, betraying the disbelief around. It did better in the race with a double points finish of seventh and eighth with Alonso ahead. Alonso indeed ran close behind Hulkenberg all the way, who got sixth. A combative Kevin Magnussen maintained Haas's strong start to the year with fifth. The under-rated Marcus Ericsson in the improving Sauber and then Esteban Ocon's Force India completed the scorers. We have but a week until the next instalment, in China. And given what we've experienced so far in 2018, you'd be advised not to predict what will happen next. A simple 2018 F1 season got a lot less simple this weekend in Bahrain. A good enjoyable race. A first, no advertisements on ESPN. UDEP has come close to that. I use to watch the world feed before scrambling. Nice. Watched a F2 race last night and they only have 1 man per wheel. Looks like a better technique than IndyCar of bringing the new tire by reaching through the legs with 2 hands. Fast. Ms. Williams did you see that? You say the new rules will save Williams, do something now and cut personnel. I suggested to FIA a long time ago that they have engines that were a quick rebuild. Like using standard over the counter cylinder sleeves. I hope that is what FOM is talking about. The rest of their plan sounds good.I hope the hybrid part is just a generator motor and battery. Just read that Li-ion can be recharged a lot quicker than now. I hope they try compressed air or fly wheel. More efficient. Although capacitors might work. I do not see how mistakes like Ferrari pit release can happen. I hope that gambling is not involved and that kick backs are not involved in the large difference from different teams in personal. What happened in soccer comes to mind. Hi Samuel - thanks for getting in touch. Yes it's not a good look that four times in two rounds (including that Kimi was released without a wheel attached in Bahrain practice). I wonder about these automated green light systems, given the issue every time has been that the car is released before the work is done where there's been a delay/sticking wheel. Maybe a solution is to bring back the lollipop man at the front, so you have a human who can see everything that's going on before releasing the car? Yes Liberty's plans sounded good but didn't have all that much detail, though apparently the teams have been given a bit more detail than we know in public. I like the idea of a budget cap too but I'm not at all sure how it can be worked in practice.